Initially linked to the Dada Group in Zurich, he exhibited at the Voltaire cabaret in 1916. 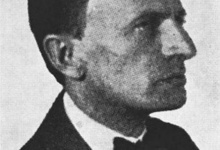 Tristan Tzara introduced him to Hans Richter, with whom he worked until 1921. They share the ambition to integrate time and movement into painting. To do this, they start by making long scrolls painted with abstract motifs ("Horizontal-Vertical Orchestra", "Diagonal Symphony"). His research is oriented towards visual counterpoint, inspired by musical counterpoint. Cinema will allow him to complete this work, to put it into motion. It fits perfectly into the artistic avant-garde of its time. One can feel Kandinsky's influence on the link between abstraction and music as well as the utopia of inventing a universal language. It attracted the attention of artists such as the German Theo Von Doesburg or Raoul Hausmann. "Symphonie diagonale", made under difficult material conditions, is his only completed film. However, it remains of great importance for the history of cinema.